Croatia Cruising Companion will help you make the most of your trip. For those that aren't chartering their own boats, a ferry trip is a good substitute. Nowhere on the mainland coast is far from a ferry port to one or more of the islands and, in many cases, the journey is at least as pleasurable as the arrival. The main state owned ferry line, Jadrolinija, has good English pages and you can search the schedule on the map. Click on the various districts and you will get the local, rather than the international ferry services. A number of other companies run smaller local services, normally just in the high season, so check at the local tourist offices to find out what's on offer. If you've hired a car then an up to date map is your best friend. The motorway is still being worked on to the south of Split towards Dubrovnik, but from both Istria and Zagreb to Split, the work has long since been completed. You may prefer the scenic views of the coast road but the motorway can save a great deal of time for long trips or to get to places like the Krka National Park and its spectacular waterfalls. For online help, link to the Hrvatski Autoclub site which also has English pages and plenty of road information, including maps. Thanks to Blue Yachts for today's photo of a couple of their charter boats going through their paces. We last reported on the cost of living in Croatia nearly a year ago. The major change since then is the exchange rate. Whereas, last year, we used to use 10 kunas to the pound as a rough guide and get a pleasant surprise, now it's not so pleasant. Today's exchange rate is 9.16 which is slightly better than it has been but still no where near the 10.5 we had got used to over quite a long period. Apart from that, so far, hotel prices seem to have remained fairly static and just a few restaurants, so far, have put up their prices. We can still buy a 30 cl beer at our local cafe for 9 kunas but one of our favourite good value restaurants in Trogir has put their beers up to 15 kunas. Other than that, food and drink prices in the supermarket still remain relatively static, a packet of cigarettes is still about 15 kunas and we eat out for about 250 kunas a head - main course, bottle of wine and coffee. Petrol of course has gone up as elsewhere though it's still quite a bit cheaper than in the UK. Apart from that, most of what we wrote last year still stands - link to http://croatiaonline.blogspot.com/2007/07/our-earlier-posting-on-cost-of-living.html for a full report. Primošten is one of our favourite Dalmatian mainland coast towns. Not only is it picture postcard pretty - from a distance as well as up close - but it has pretty well everything you need from a seaside holiday. Hotel Zora, set apart from the town, provides 3 and 4 star luxury, a separate beach, swimming pool and entertainment. In the compact town itself there are some quality apartments to let, oodles of restaurants, including two or three with spectacular views, and cafes and ice cream parlours galore. The pebble beaches are child friendly and a walk around the compact peninsula reveals some secluded beaches, mostly concreted, and some lovely old houses. With all that, Primošten retains its unspoilt charms, and the magnificent cemetery at the top exemplifies the cared for feel that embraces the whole of the town. Only a couple of years ago, you'd be queuing for a seat at any one of the several cafes on Split's seaside promenade on a sunny summer afternoon. Now you'll feel very lonely drinking your coffee in the clinical ambience after the expensive makeover. A couple of the cafes, like the one in the foreground, have rebelled against the dictat that says all the chairs must be uncomfortable, uniform, metallic, space-age-type designs. However they can't do much about the concrete slabs which reflect too much heat and light, or the ugly metal lights and awning machinery. So the result is that locals, and tourists in the know, head inside the Diocletian Palace for their coffees and the Riva has become something of a ghost town. Split residents have voiced their views vociferously and indeed may well get some concessions. Most people just want a return to how it was, where the cafes had scope for taseteful and individual terraces, coffees were a reasonable price and the beautiful facades of the old buildings weren't obliterated by ugly metal poles. Where NOT to go in Croatia might be a better title for today's posting. And the answer is Dubrovnik. Yes it's a jewel of a town but the locals are getting sick and tired of the small alleyways of the old town being jammed to capacity by the the passing cruisieliners, and it's only June! On Friday three cruiseliners arrived at the same time and poured out 12,000 passengers into Dubrovnik's lovely but tiny medieval core and the city's indignant inhabitants were urged by the local press to stay at home. There have been as many as 5 at the same time and one, exclusively gay, cruiseliner caused a bit of a shockwave last year amongst the conservative catholic dalmatian community when its passengers continued their cruise onshore. Apart from the berthing fees (which are sizeable and very dear to the heart of the port authority) the passengers spend very little onshore so it's easy to understand why Dubrovnik's citizens have had enough. They'd much rather look after the land based tourists who don't seem to baulk at the fact that Dubrovnik's prices, along with those in Hvar town, are at least 50% higher than elsewhere on a like for like basis. It's a shame to miss Dubrovnik's city walls but is it worth it under these conditions? Likewise it's a shame to miss Hvar Town but similar questions apply. Other destinations that get crowded in the summer are Korčula Town, Trogir, Istria's main coastal towns and just about everywhere in August but there are still some great escapes. Those seeking tranquility should try the islands of Mljet, Lastovo, Ugljan and Dugo Otok. 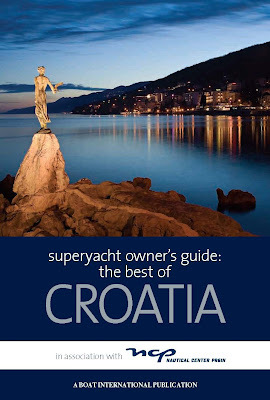 For complete respite, chartering a boat, with or without a skipper is the answer - just check out our Croatia Cruising Companion for the best out of the way places. Today's photo is of one of the offending "vehicles" guarding the bridge over the River that leads to Dubrovnik's ACI Marina. Keep on heading past the river and the ship and you'll find the old town and Dubrovnik's port of Gruz.